Administer 2 grams per liter of drinking water continuously for 5 days. Use two measuring spoons (10 g.) In 5 liters of drinking water. Plastic jar with 100 grams. Display with 25 envelopes of 10 g.
Its broad spectrum allows effective treatment of diseases, alone or in association. 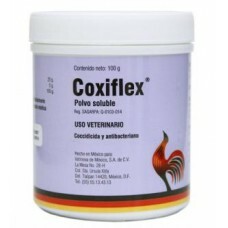 The effect of Coxiflex is observed within a few hours of its administration. Due to its rapid action, it prevents the birds from losing physical condition and weakening excessively.